On February 21, 2019, State Councilor and Foreign Minister Wang Yi held talks in Beijing with Foreign Minister Chingiz Aidarbekov of Kyrgyzstan. 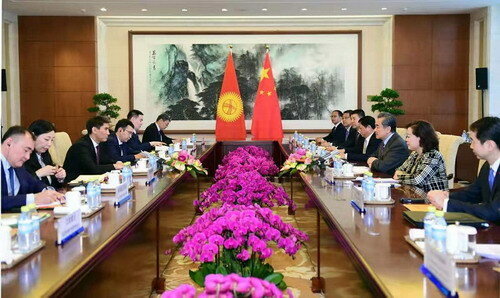 Wang Yi said that over the past 27 years since the establishment of diplomatic relations between China and Kyrgyzstan, both sides have enjoyed a high degree of political mutual trust, close economic cooperation, mutual reliance on security, more active people-to-people and cultural exchanges, and fruitful results in jointly building the Belt and Road Initiative. Last year, the two heads of state announced the establishment of China-Kyrgyzstan comprehensive strategic partnership, which was a major event with milestone significance in the history of bilateral relations. 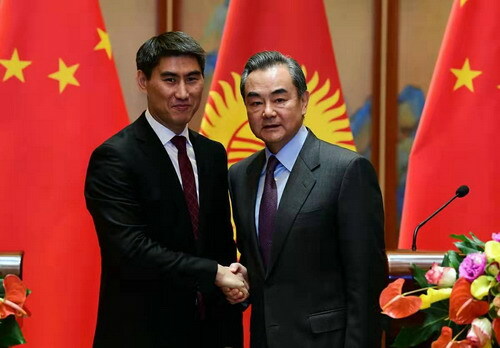 China-Kyrgyzstan relations have solid mutual trust and political foundation, and no external interference can affect the development of bilateral relations. The Chinese side has, as always, firmly supported the Kyrgyz side's independent choice of development path, and supported the Kyrgyz government's internal and external policies of safeguarding national independence, sovereignty and security. The Chinese side stands ready to work with the Kyrgyz side to well implement the important consensus reached by the leaders of the two countries, strengthen the alignment of development strategies, promote economic and trade cooperation, steadily push forward the production capacity cooperation, and carry out sub-national cooperation, in a bid to promote China-Kyrgyzstan relations to new stages. Wang Yi said that Kyrgyzstan is an important partner that firmly supports and actively participates in the building of the Belt and Road Initiative. It is hoped that the two sides will constantly expand the space of mutually beneficial cooperation through the joint building of the Belt and Road Initiative. China welcomes President Sooronbay Jeenbekov to attend the second Belt and Road Forum for International Cooperation in China. The Chinese side is ready to fully cooperate with the Kyrgyz side, as the rotating presidency of the Shanghai Cooperation Organization (SCO), in well hosting the SCO Bishkek Summit this year, and promote the SCO to realize new development at a new starting point. Chingiz Aidarbekov said that Kyrgyzstan and China are like the two wings of a bird with a common destiny. Recently, some negative voices concerning Kyrgyzstan-China cooperation in Kyrgyzstan are results of external instigation and being utilized by some forces, which are intended to undermine Kyrgyzstan-China relations and by no means represent the Kyrgyz government's policy toward China. About all these things, President of Kyrgyzstan and I have made public and clear clarification on many occasions. I would like to reiterate once again that the Kyrgyz government highly values the friendly relations with China, firmly supports the Chinese side's just position on any issues concerning China's internal affairs, including the Xinjiang-related issue, and continues to firmly pursue the one-China policy. The Kyrgyz government will exert its utmost efforts to maintain the everlasting friendship between the two countries and always be a good neighbor, good partner and true friend of China who trust and support each other, so as to benefit the two peoples. 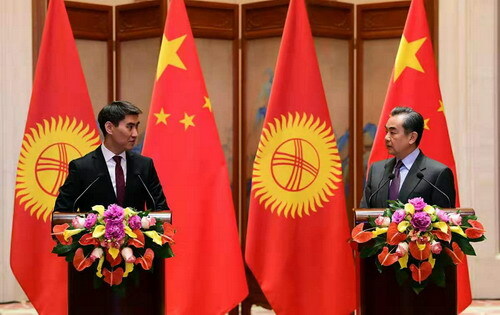 The Kyrgyz side is willing to, together with the Chinese side, intensify communication, maintain high-level exchanges, and promote cooperation in various fields including economy and trade, connectivity, and production capacity within the framework of the Belt and Road Initiative. President Sooronbay Jeenbekov looks forward to attending the second Belt and Road Forum for International Cooperation in China. The two sides exchanged in-depth views on strengthening security cooperation and other issues of common concern.